here’s one more thing you’ll love! Not now, thanks! Take me to the Blog. ✓ In-depth Brand Questionnaire to align your brand authentically with YOU, and build it from the inside out. 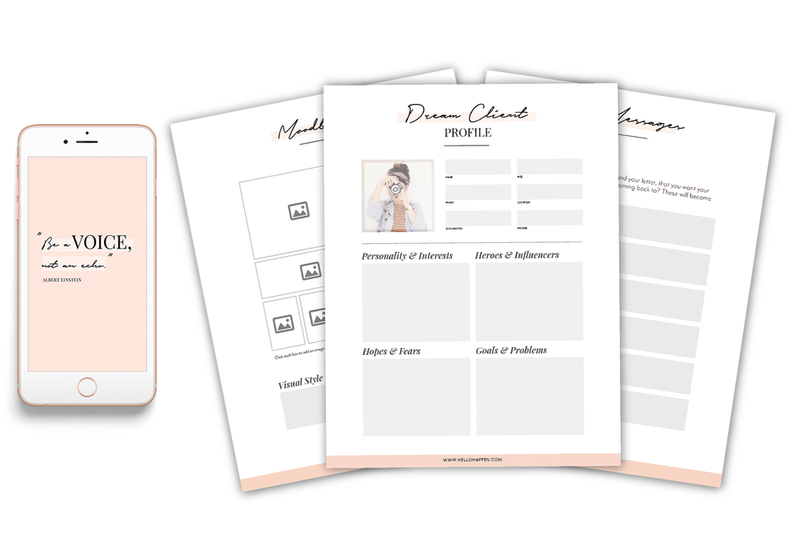 ✓ Easy-fill PDF Templates for your brand, including Dream Client Profile, Moodboard, and Core Messaging templates. No Canva, Photoshop, or other fancy software needed! Super easy to fill out & reference every time you create new content. ✓ Fillable Digital or Printable PDF so you can fill it out on any computer or tablet, or print to fill it out on paper at your favorite coffee shop! ✓ BONUS iPhone wallpapers to make your phone as fabulous as you are, and keep you motivated! But if you don’t, no worries! Let me know within 30 days for a refund.